Sarah Cook, director of UNRISD, was in Sheffield last week to give the Siid (The Sheffield Insitute for International Development) Annual Lecture “The ‘Universal Framework’ for Sustainable Development: A new global paradigm or business as usual?”. (see ‘Sarah Cook visits SIID for Annual Lecture’). 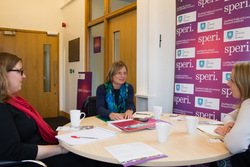 Sarah Cook also visited SPERI and held discussions with two of our Research Fellows: Hannah Lambie-Mumford and Genevieve Lebaron. The United Nations Research Institute for Social Development, founded in 1963, is an autonomous Institute of the UN which undertakes ‘multidisciplinary research and policy analysis on the social dimensions of contemporary development issues’ of concern to the UN system. Information about SPERI’s and UNRISD’s respective areas of work was exchanged and much common ground was found. Sarah Cook was particularly interested in SPERI’s work on the impact of austerity measures on the right to food. She discussed among other things UNRISD work on the politics of domestic resource mobilisation in low income countries and the fiscal bargains involved in determining how the revenues are used.